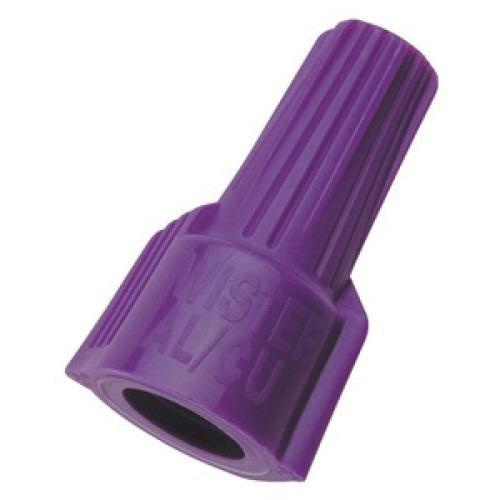 Ideal Industries Twister® 65 Model wire connector in purple color, accommodates solid aluminum conductor of size 12. It has voltage rating of 600-Volts. Wire connector features polypropylene housing with zinc plating steel insert. Connector has pre-filled antioxidant compound to avoid oxidation of aluminum conductors. Swept wings and hexagonal head aids for quick and easy installation by hand or with standard nut driver. It measures 0.65-Inch Dia x 0.8-Inch x 1.34-Inch. This wire connector has strip length of 1/2-Inch. It withstands temperature rating of 105 deg C. Wire connector is suitable for bonding and grounding applications. Wire connector is UL listed, CSA certified, RoHS compliant and meets NEC standards.